1. ST. TROPEZ self tan bronzing mousse ($18). I am a big believer in sunscreen, but it does not mean I cannot have a nice tan and healthy glow! One application of ST. TROPEZ makes a difference. Need a how to guide? Check out this very entertaining Man Repeller's how to tan at home guide. Jergens Natural Glow daily moisturizer ($10) is also a great tanning lotion for a great price; but you have to be a little more dedicated because it takes a few applications to start seeing the difference. 2. 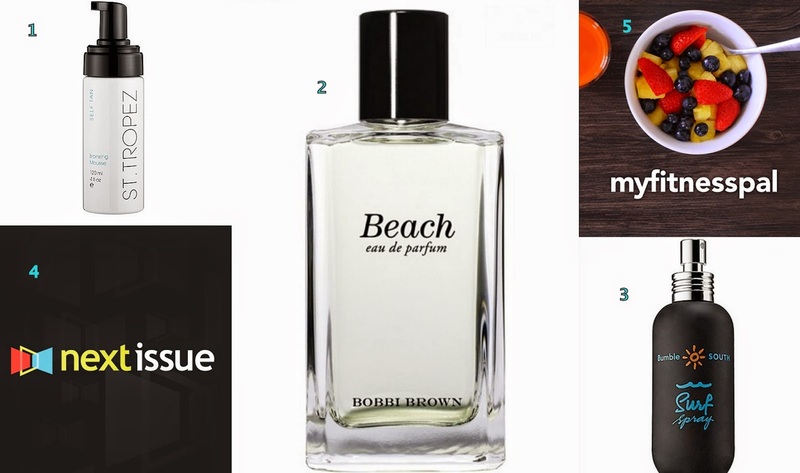 Bobby Brown Beach Eau de Parfum ($72) or Beach Eau de Parfum Rollerball ($25). This light and fresh scent brings up that relaxed feeling I get when I feel the sand under my feet and inhale the ocean breeze. I have the rollerball and always keep it in my bag. Whenever I feel I need a good infusion of happy, I dab a drop on my wrists' pulse points... Sense of smell is a powerful thing! 3. Bumble and Bumble surf spray ($15). This salt infused formula adds volume and, most importantly, the texture and the feel of wind blown hair. Now you can look like a care free beach girl while doing something not as fun by your desk. 4. Next Issue app ($10-$15/month, first month free trial). This app gives access to many of my favorite magazine subscriptions. It is great for any time of the year, but during summer, when I spend a little more time gardening and decorating, I download home and garden magazines and swipe through them on iPhone or iPad whenever I can. And if I see something I like, I either bookmark it or just take a pic of the screen. Got to take advantage of this technology age! 5. MyFitnessPal app (free). Ok, if you are like me, there is a very high chance that you are interested in loosing a pound or two, especially during summer! And this app helps me, really. It is a calorie count app and helps me understand what I eat in the sense of calories, nutrition, carbs, proteins, water intake, exercise... It is kind of my fitness buddy. And I love the feature that allows to scan the bar code of products I eat instead of typing the names in. Life is busy, so the shortcuts are my friends!